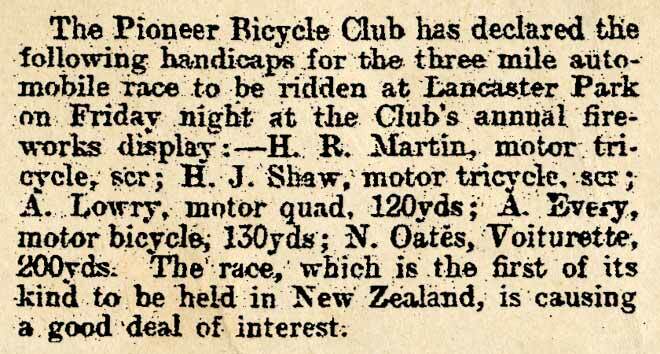 Motor cars were so unusual in New Zealand in 1901 that this newspaper article noted the first race between them under the broader headline of 'Cycling'. The competitors' vehicles were a Comiot tricycle, a Brown quadricycle, a Benz voiturette (an early motor car) and a Minerva-engined bicycle. They were handicapped by starting at different lengths behind the starting line, with the tricycle on scratch and the Benz 200 yards behind it. The motor bicycle won the 3 -mile (4.8-kilometre) race by a quarter-mile, in 11 minutes 8 seconds, followed by the quad bike and the tricycle, with the Benz well back.